Fine particle pollution, commonly called soot, causes many serious health problems. Fine particle pollution is also one of the few pollutants that you can actually see. The photos below show Newark, N.J. (with the New York City skyline in the background). 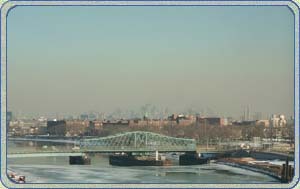 This view looks eastward from the NJ Transit headquarters in Newark toward lower Manhattan, about 10 miles away. 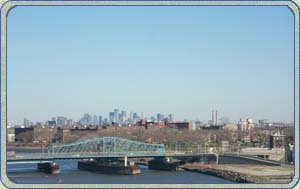 In the foreground stands the historic Jackson Street Bridge over the Passaic River, connecting the "Ironbound" section of Newark (visible to the right and at mid-distance) with Harrison, N.J. (off to the left). The green capped spire adorns St. Aloysius Catholic Church in Newark. "Photos courtesy of www.hazecam.net and the Northeast States for Coordinated Air Use Management (NESCAUM)".